War Horse was adapted by Steven Spielberg as a major motion picture with Jeremy Irvine, Emily Watson, and Benedict Cumberbatch. The National Theatre production opened in 2007 and has enjoyed successful runs in the West End and on Broadway. A great way of introducing young readers to the realities of WWI. Look out for Morpurgo’s other war books including Friend or Foe, Waiting for Anya, King of the Cloud Forests and An Eagle in the Snow. War Horse is a story of universal suffering for a universal audience by a writer who ‘has the happy knack of speaking to both child and adult readers’ (The Guardian). 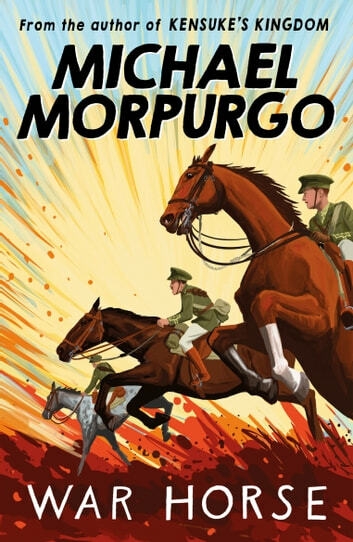 Michael Morpurgo has written more than one hundred books for children and won the Whitbread Award, the Smarties Award, the Circle of Gold Award, the Children’s Book Award and has been short-listed for the Carnegie Medal four times. Michael Morpurgo OBE was born in 1943 in St Albans and was educated at Kings Canterbury, Sandhurst and Kings College London. He taught for ten years in both state and private schools and is married with three children and six grandchildren. His first book was published in 1975 and he has since published over 100 titles. His books have been translated into over twenty languages. Michael's books have also been adapted for film and the stage, including most recently the National Theatre's enormously successful production of War Horse. Together with his wife Clare he founded Farms for City Children, an educational charity, in 1976. The organisation now runs three farms welcoming over 3,000 children a year. In 1999 he was awarded an MBE for services to youth, and in 2006 he was awarded an OBE. His books have won the Whitbread Award (The Wreck Of Zanzibar), the Smarties Book Prize (The Butterfly Lion), the Children's Book Award (Kensuke's Kingdom) and Cercle D'Or Prix Sorciere (King Of The Cloud Forests), the Blue Peter Book Award and the Califonia Young Reader Medal (Private Peaceful), the Independent Booksellers' Book of the Year Award (Alone On A Wide Wide Sea) and several have been shortlisted for the Carnegie Medal. Michael was Children's Laureate from 2003-2005. It was an easy book to read and gave much more clarity to the play I just saw. Interesting book with much emotion. What a wonderful story. I have read the whole book in a couple of days and thoroughly enjoyed every bit. I cried tears of sadness and in the end tears of joy. Excellent.